Color matching macarons is one of my all-time favorite things to do. It's a challenge to capture the nuances of framboise (raspberry) macarons. Little paintboxes are my other obsession. I gave many away when I moved to Paris. And I have probably replaced everyone of them by now. 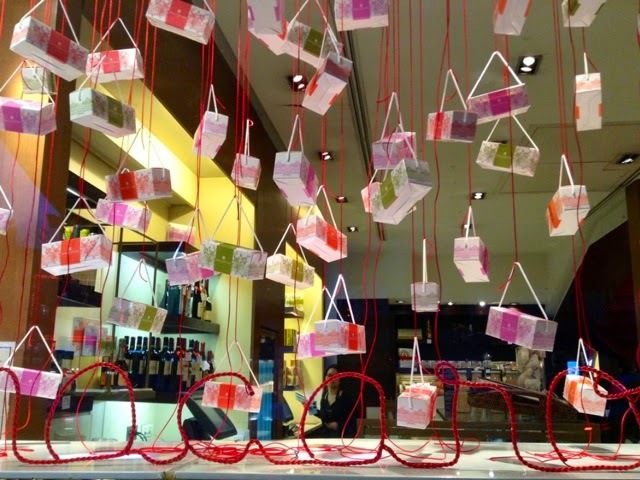 When I saw these pretty boxes in Charvin's window the March letter came together. 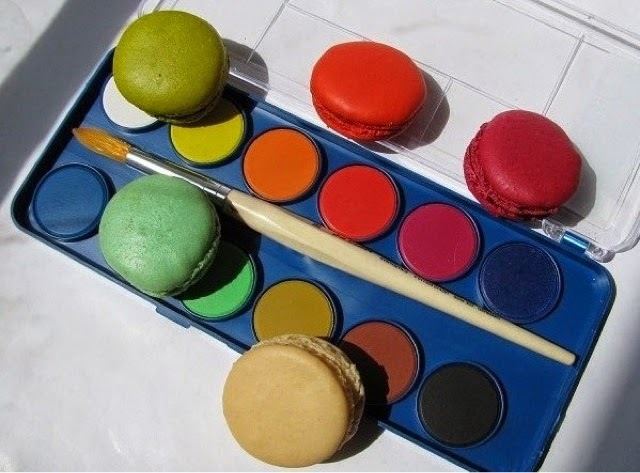 Some paintboxes have macaron-shaped color pans, but the quality is mostly kids level. Still this guy was using them on the bridge near Notre Dame. This looks like fun doesn't it? 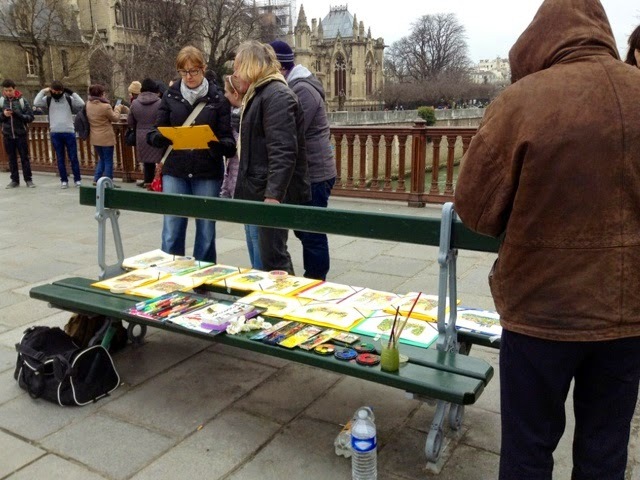 To hustle your watercolors on a bridge in Paris. In the end the beautiful colors won out. 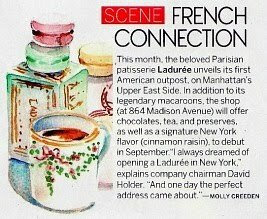 Did I say we just have 18 days until it's Jour du Macaron? 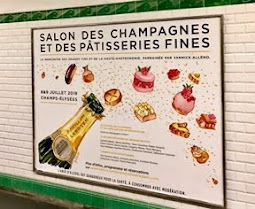 The 20th of March annually has become the day you can wander from patisserie to patisserie in Paris (and New York too now). 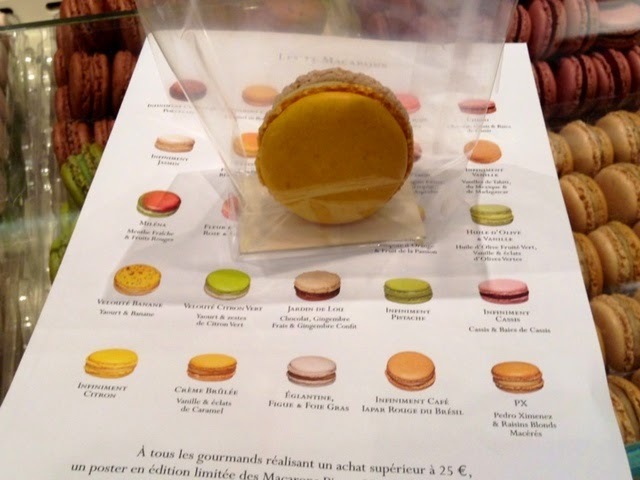 You give a donation to charity and receive in return a macaron (if the patisserie is a member of Dessert Relais patisseries and many are in Paris. 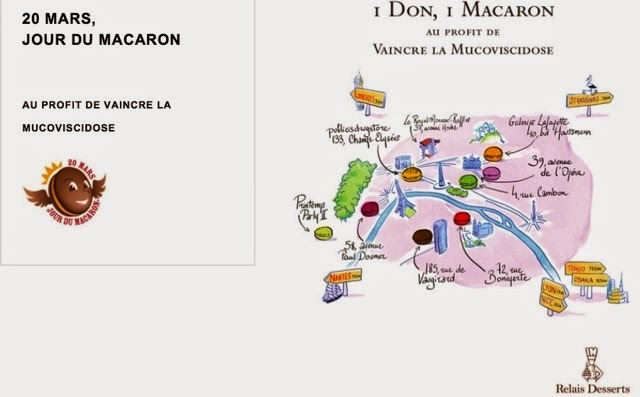 These days Jour du Macaron has become WEEK-END du Macaron so you have 3 days of macaron hunting. 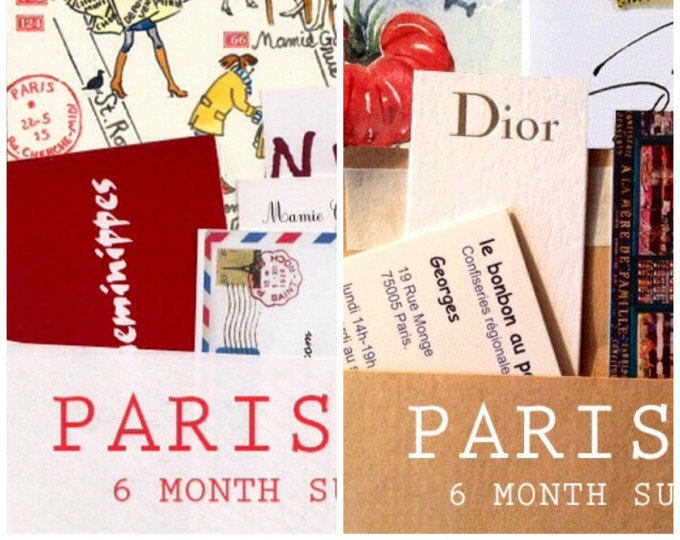 March's Sketch letter had to celebrate Paris macarons? Finding macaron souvenirs to put in the envelopes, on the other hand, was harder than finding hens teeth. 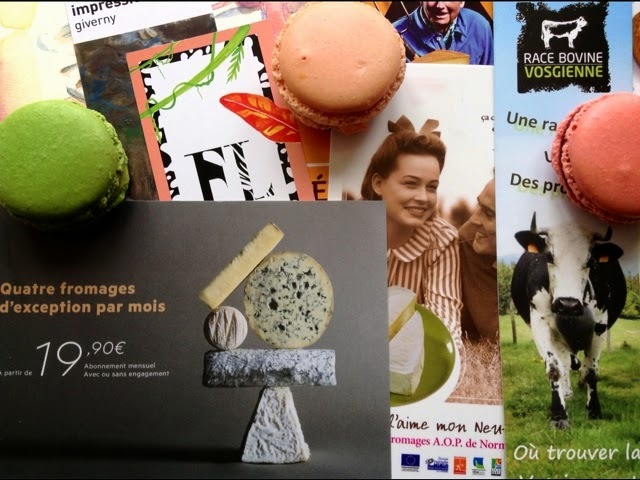 Some of you may be lucky enough to get a cow or Brie bookmark from the Salon de l'Agriculture. Or an offer to subscribe to a monthly supply of French cheeses no less! Bear is counting off the days on the calendar till Jour du Macaron. Your paintboxes make my heart flutter. 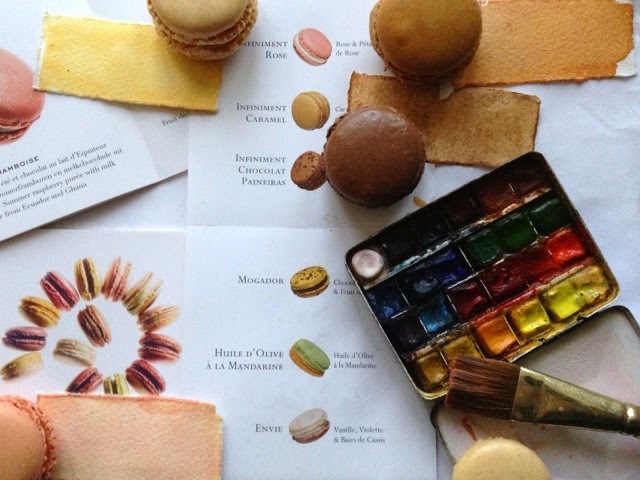 And what's not to like about a macaron's look? Fantastic color matching! Love, love, love those macs. I happen to own the very set of watercolors that vendor has sitting on his table....each level screws onto the lower level...have never even tried that paints! For shame! I'm betting they're not so great. I had no idea...I should stop back for a closer look and better shot. 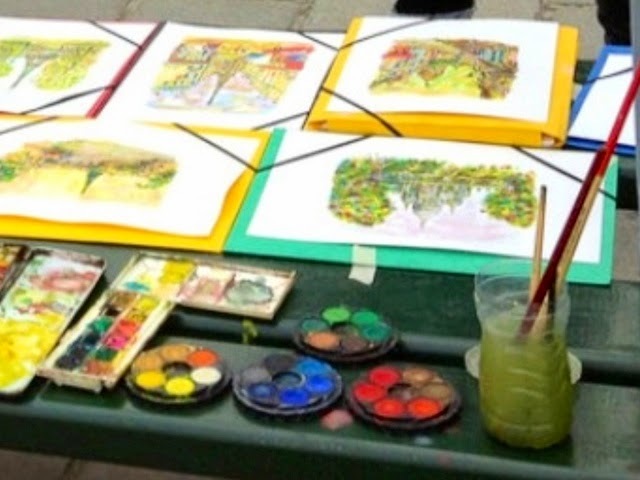 His watercolors were so-so I have to say. Maybe it's the kids paints? Macarons are endlessly pretty...the colors are to die for. 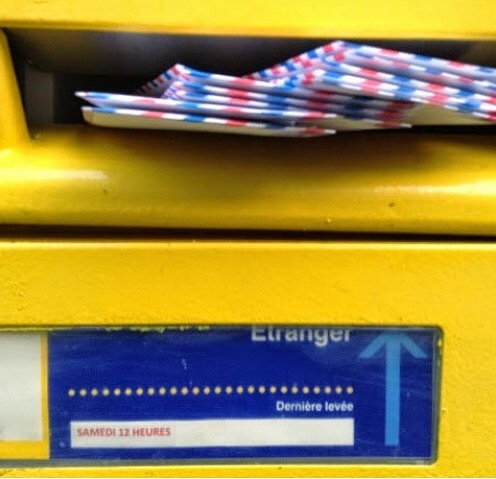 Lovely post! Just last week I bought hubby his first macaron. He was very surprised how delicious it was. Now I will have to try making them myself since the closest and only ones I can get are about 60 miles away and cost $2.00 each at Whole Foods. Still, yum! I love them for their texture more than their flavors. I do so love your macaron colours, Carol. You make painting look like a piece of cake! Beauties. 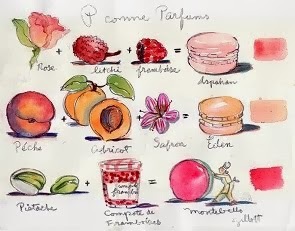 Also looking forward to macaron day - lots of visitors so at least it's not difficult to work out where to take them! You could do it in a snap. You already mix the tints for the macarons don't you? 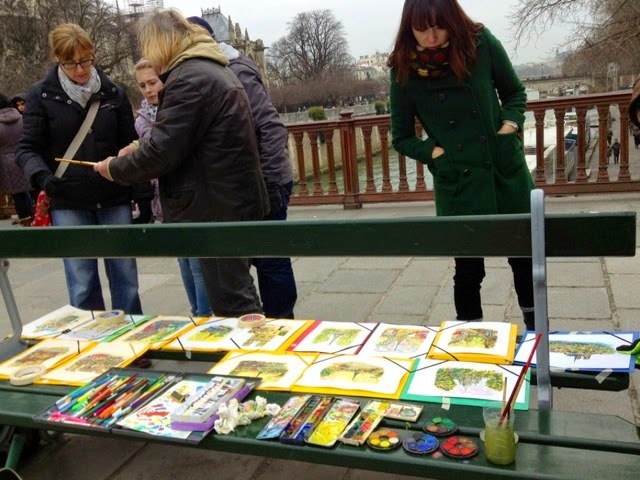 Wish I could be painting in Paris! I can see the David Dewey influence in your w/c's. 20 years (!) of classes will definitely influence you. So glad I found David Dewey! What a lovely sketch letter for March! I had my first macaron last April and they certainly are addictive! I brought bunches home for friends from Ladurée because I live in the middle of PA. Yum! I must tell you that all the food festivals you write about make me long to be there for longer than a month! Perhaps I will succumb to 3 months soon! An especially good one, Carol. Pretty as a picture and yummy, too. Did you change your email address? My message to you keeps failing. My correct email is above under Contact. 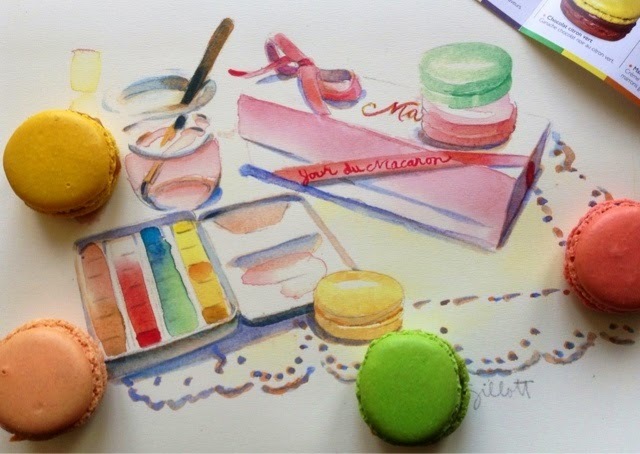 My favorite watercolor~ your March Macaron Celebration sketch letter. I love that your watercolor tins look thoroughly used and enjoyed. I almost feel better about the dreadful condition of my own. Mine is a Schmincke, rusty and grubby. sigh. 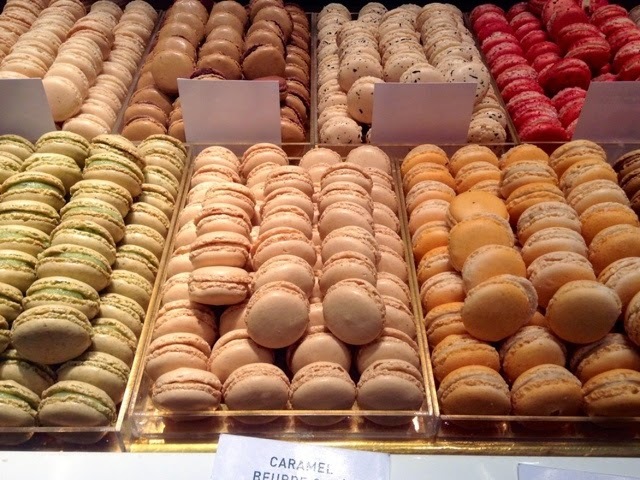 Oh, so many macarons!! Can't wait to read about Bear's adventures on le weekend du macaron. This is officially my favorite PB post of all time. I'm a macaron maniac! And seeing this reminds me that it is time to again make macarons with my friend Kate. Our experiment last year was so successful, we much try new flavors this year! 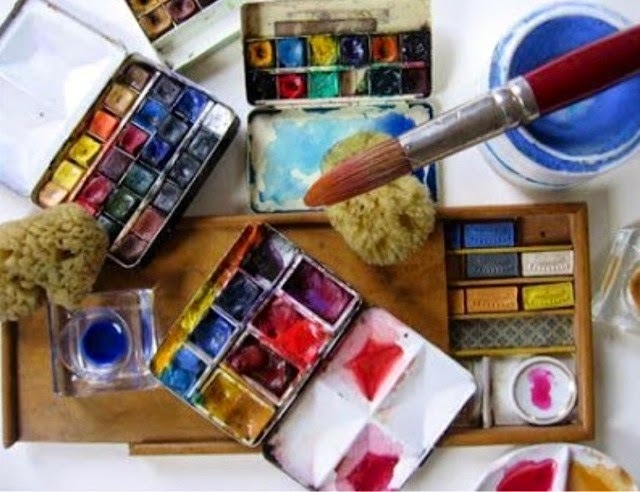 But what I love as much are your images with your colors and watercolors and little boxes. 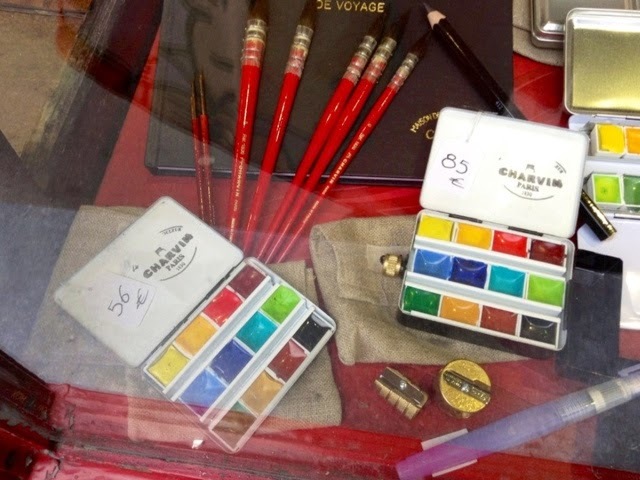 I love anything with painting bits and art supplies and seeing yours is just the best. All that and your wonderful illustrations! I loved the March letter which arrived a couple of days ago. it's right where I can see it and smile! What a fun exercise to color match! But I'm afraid the models would disappear before I got the colors right! 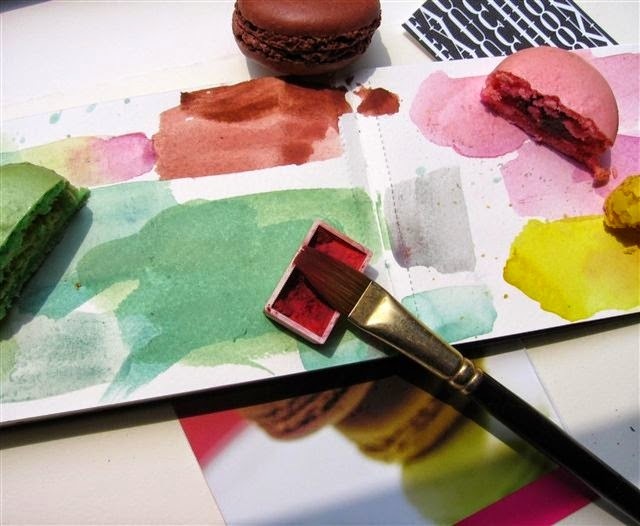 Ah Carol, only you could see macarons in a watercolour set! But now that you mention it- I can see it too. 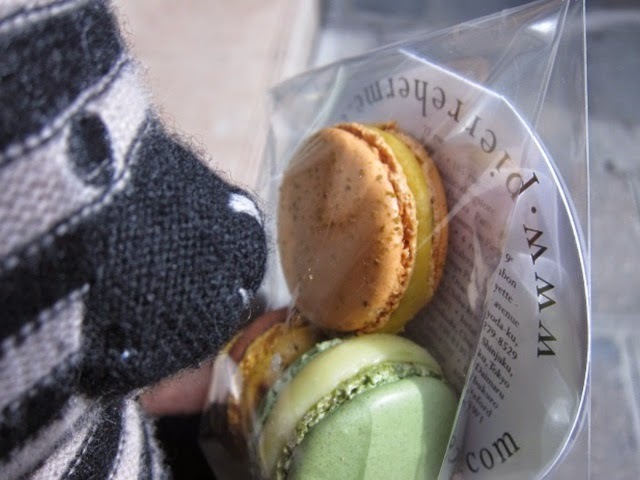 I love your palette of pistache macarons. How I envy you Jour du Macaron. I really need to be in Paris for that one year.